Mobile Financial Service is to provide limited banking services to customers via their mobile phones. It is also called as Mobile Commerce or Branchless Banking. Such type of services are widely being used in other parts of the world since long. It was first launched in 1997 in Finland. Telenor in collaboration with Tameer Bank launched EasyPaisa, first mobile financial service of Pakistan in 2009. Ufone also launched UPayments service with support of HBL, Bank Al Habib, Soneri Bank and Summit Bank Ltd. Recently Zong and Mobilink started their mobile banking services almost at the same time. Zong partnered with Askari Bank while Mobilink with Waseela Bank. People usually use these services to send and receive money and to pay utility bills. There are also other facilities offered by these companies، few of these offer mobile bank accounts too. 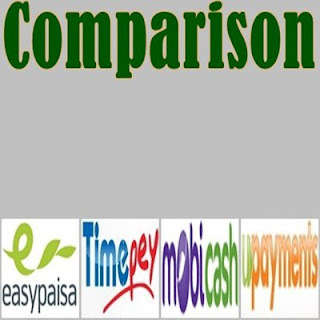 The best thing of all these services is to easily pay bills without long queues and to send money in any part of the country with no delay, at any time. For example, if you want to send money to a person in any other city in off hours, on holidays or on weekend and it is also urgent. You don't need to worry, just visit an agent of your preferred mobile banking service provider with your CNIC. Give him cash and tell him the name and mobile phone number of the receiving person. Soon you will receive the confirmation message and receiver will also get a message about it. So this whole process will complete in minutes and other person can receive money from his nearest retailer of that specific company. Following is a comparison table of basics of all the four service providers. Funds transfer fee, cash deposit and withdrawal charges for account holders may be different. Please confirm charges, delivery time and other details from your local agent or any official of the company.